We show how two-point turbulence models based on triadic closures, initially developed for homogeneous isotropic turbulence, can be applied to anisotropic turbulent flows. Efficient numerical solution of these models is now feasible thanks to new computational capabilities. 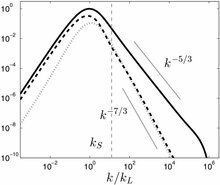 This permits exploration of their dynamics and structure at high Reynolds numbers and offers a complementary approach to direct numerical simulations. In this paper, implementation strategies, developed for shear and buoyancy driven turbulence, are reviewed and compared. A single formalism for anisotropic turbulence is proposed for both problems. Analyses of weakly anisotropic turbulence, for scales much smaller than Corrsin’s scale (shear case) and Ozmidov’s scale (stratified case) are revisited and new scaling laws are proposed. The effect of initial data is analyzed. The entire spectral range, including the infrared range, is considered.